Our QSR digital signage solutions provide reliable and cost effective ways to communicate with your customers. 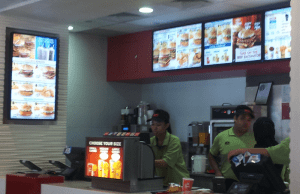 Restaurants, bars and fast food outlets (QSRs) are heavy users of digital signage. Our QSR digital signage solutions provide reliable and cost effective ways to communicate with your customers. Our QSR digital signage is easy to use so updates and local specials can be done at the local venue while regional or head office maintains complete control. The same system allows for certain content slots to be sold to external advertiser and brands like Coke or Pepsi while the restaurant retains overall control. Full proof of play data is available to allow efficient monetisation from the brand sponsor. Our QSR digital signage can change automatically based on the time of day, day of the week or almost any other parameter. Specific content can be triggered by the POS systems or other input methods. The same content management system (CMS) support full touch screen kiosk deployments for remote ordering applications or collection of data such as mailing list information or other promotional activity. All menu screens can form a video wall and show multiscreen content at no extra cost. Sequence stacking allows collaborative control of a common base sequence. Control which slots in a base sequence can be overridden by another user. Build complex stacked sequences merging international, national, regional, local and screen specific content. Each layer controlled by different users. Slots can contain inner sequences controlled by another user. Grant a user access to a specific slot in a sequence. Ideal for advertisers.